Starting from the premise of Muntadas as an outside observer planted in three countries, he develops his own research exploring questions about the idea of “protocol” as applied to culture, politics, education, society, public and private space, economy, the religion, etc. As an artist, his analysis takes the form of videos, installations, documentary films, archives, and others – an array of disciplines that Muntadas has been exploring for the several decades. 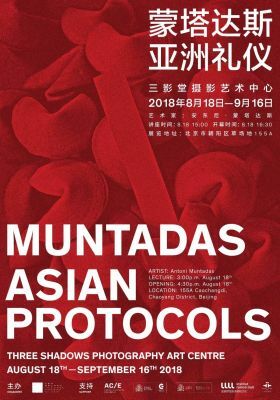 Asian Protocols, then, is a visual research work focused on the cultural background of the three countries, dissecting the similarities and differences between the collective and the individual in all three. It also attempts to break down stereotypes about the three countries, focusing on three megacities: Beijing, Seoul, and Tokyo. The exhibition does not intend to delve into politics explicitly, but rather how history and culture condition the manners, gestures, and forms that societies build into themselves. Nor does it intend to apply a critical lens to any of the three countries or societies –just an analytical perspective. It not only focuses on similarities and differences, but conflicts and the potential for cooperation. The first instalment of the project was presented at the Total Museum in Seoul in 2014. In 2016 the project was shown at 3331 Arts Chiyoda in Tokyo. The third and final exhibition will be held at The Three Shadows Art Centre in Beijing in August 2018. The project will be possible thanks to the support of Acción Cultural Española AC/E, the Spanish Embassy in China, the Ministry of Culture of Spain, the Institute Ramón Llull from Barcelona, Foundation for Contemporary Arts Emergency Grant, and the collaboration of Cervantes Institute Beijing as well.